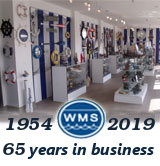 Handcrafted model ships offers the most extensive line of model ships and boats from movies and television. From James Cameron's Titanic to old episodes of Gilligan's Island, a ship's adventurous voyage across the ocean has been the premise of many visual stories told through movies and television. For most of us, these vicarious experiences have been our only opportunity to experience sailing on an oceangoing vessel. Stop and think of a line from the Steven Spielberg's Jaws. It was probably Captain Quint saying, "We're going to need a bigger boat." Well now you can say it as you point to your very own model of the "Orca" (the name of Quint's boat in the movie). And while Robert Zemeckis' Forrest Gump is not what most would consider an epic tale of the sea, the fact that he named his entire fleet of shrimp boats "Jenny" was the most tangible example of the main character's love. Relive the fantasies of life at sea with our extensive line of model boats and ships from movies and television.